Could it be? Game mechanics info! This week’s Friday Update comes from the Developer Blog and contains a fair amount of information on how the Advanced Class System will work. ACS will be able to “support several play-styles within each of those eight classes” offered to players. 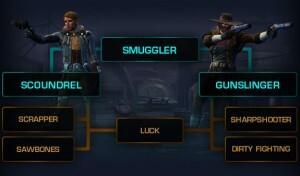 The blog goes on to examine the Smuggler up close, revealing new play-styles — Scrapper and Sawbones for the Scoundrel; Sharpshooter and Dirty Fighting for the Gunslinger; Luck bridges the gap between both sides. The article also discusses specific abilities such as “Shoot First,” available to Scoundrel AC. Read the full article here.